Jobu reviews the Yankees’ series against the Toronto Blue Jays. To say this was a must-win series is to accuse you people of not knowing there’s a pennant race going on right now. With Baltimore refusing to lose (they won an 18 inning game on Monday… 18!! and an 11 inning affair on Tuesday to boot! ), the Yankees needed to keep pace, and set the pace at the same time, as they clung to a 1 game lead coming into this game. The rainout Tuesday meant a double-header on Wednesday, which is always fun in a pennant race, right? Anywho, the Yankees finally flexed some real muscle against a crappy team, sweeping the Jays out of the building in a series that really belonged to Ichiro Suzuki. This was probably one of the more crucial games left on the schedule as far as the Yankees’ playoff hopes are concerned. Why this game, against the third place Toronto Blue Jays? Because the Yankees had Andy Pettitte coming off the DL in this one. It’s no secret the Yankees needed to stabilize the rotation with some more wins, which Pettitte hoped to notch against the Jays’ Henderson Álvarez on Wednesday afternoon. 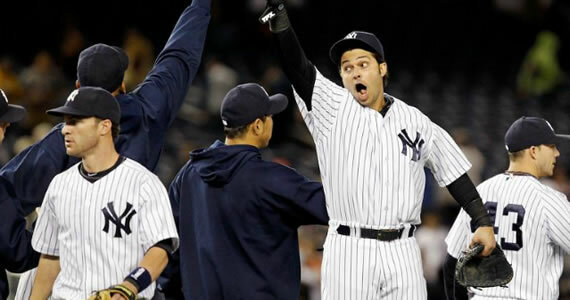 To say that Andy calmed some nerves in Yankees Universe is an understatement. He’s not, by any means the single key to their success moving forward, but pitching is in general. The Yankees needed Andy to come up big in this game, and he did. Was he perfect? Was his control on point? No and no. Andy was definitely a little rusty, but he managed to get through the fifth inning on his 70-75 pitch limit (despite having 54 pitches through three innings). more importantly, he held the Jays scoreless in those five innings. It was better than what we could have expected. Andy’s final line looked like this: 5 IP, 4 H, 0 R, 2 BBs, 3 Ks, 75 pitches and his fourth win of the season (4-3). The bullpen did a pretty great job of getting the ball to Soriano in this one. Clay Rapada, Derek Lowe, Boone Logan and Joba Chamberlain held the Jays scoreless in the sixth and seventh and, after David Robertson gave up two runs in the eighth, Soriano bailed the Yankees out with his 41st save. Untuck, Yankees win. The way this game started, you would have thought the Yankees were in for a comfortable blowout win in Pettitte’s return. Ichiro and Nick Swisher opened things up with back to back singles in the first, and Robinson Canó hit a double over the center fielder’s head to make it a 1-0 game. Then, the unthinkable happened. The Yankees had second and third with no one out, and scored both runners! Sure, a big homer or some more hits would have been great, but an RBI groundout by A-Rod and a sacrifice fly by Curtis Granderson got the job done. We didn’t realize the Yankees wouldn’t score again until Swisher’s big two-out RBI single scored Ichiro to make it 4-2 in the eighth, but at the time it was good. Swisher’s late RBI was one of those back breaking insurance runs you need to win close games too. Big Knock. One note, the 4-9 men in the order went 0-17. That can’t keep happening, but a win is a win is a win. Game two of the double header featured David Phelps, who was coming off a huge start in Boston, against Rickey Romero, who had lost 13 decisions in a row. Romero was once 8-1, and came into this game 8-14. Predictably, Romero shut the Yankees down almost completely in this game (the RISP fail didn’t help, certainly). Unfortunately for him, the Yankees pitched even better than he did, and they got the 2-1 win. Hey, at least Romero got a no decision and not another loss. I know it was just the Blue Jays, and they didn’t have Encarnación or Bautista, but Phelps looked great on Wednesday night. He started off a little shaky with his command, but straightened it out pretty quickly. At one point he retired twelve Jays in a row (sandwiched by a caught stealing and an error). He only allowed three hits: a single in the second, one in the third and one in the seventh. Simply brilliant. It kind of makes you want the Yankees to go to a six man rotation (or sit CC). Anywho, Phelpsy’s final line looked like this: 6.2 Ip, 3 H, 3 BB, 6 K, 110 pitches and a tough no decision. The bullpen took over from there. Logan got out of Phelps’ bases loaded, two out jam in the top of the seventh, and retired the first two men he faced in the top of the eighth before giving way to Cody Eppley, who struck out the only man he faced to end the inning. In the ninth inning, Soriano blew the Jays away for his 42nd save. Two untucked shirts in one day? Indeed! What a day Ichiro had on Wednesday! He brought back memories of the old Ichiro (or I guess the young Ichiro). After notching three hits in the first game, Ichiro did himself one better in game two, picking up four hits and even stealing four bases! That’s right, he went 7-8 on the day, which should keep stupid Joe Girardi from ever playing Andruw Jones again (Ichiro’s four hits in game two came against lefties). 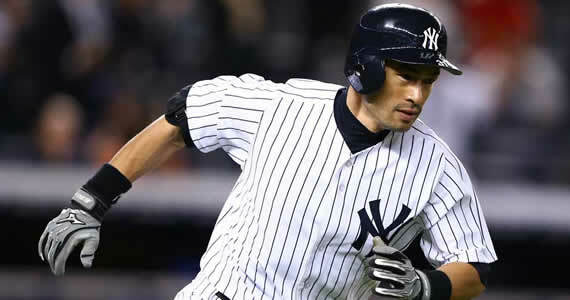 I don’t want to take away from Chris Stewart’s RBI ground rule double in the bottom of the second, but Ichiro, who is now hitting .317/.337/.439 as a Yankee, had a huge two-out RBI single in the bottom of the eighth that gave the Yankees the 2-1 win. Vintage Ichiro. Looks like someone wants the ring he never got in Seattle. A side note, the Yankees stole seven bases in this game, which was their season high. Granderson stole third base, Ichiro stole second twice and third twice, nix stole second and even Stewart got into the act, stealing second in the eighth inning. The Yankees have shied away from relying on the long ball of late, using more speed and situational hitting, and it seems to be paying off. They swept the double header without hitting one ball out of the ballpark. Impressive! The Yankees went for the sweep in game three with young Phil Hughes on the mound. In order to try to salvage one game of the series, the Jays countered with Aaron Laffey. While neither pitcher pitched particularly well, Hughes took advantage of a lot of run support and the Yankees won 10-7. Make no bones about it (still not sure what that expression means), Hughes did not pitch well in this game. He struggled with his command all night long, and needed 102 pitches to get through just five innings. He hit some batters, walked a few batters, but he also tied the major league record for strike outs in an inning, when he struck out four Blue Jays in the top of the fourth. In fact, Phil effectively used the strike out to keep the blue jays mostly off the board, until Moises Sierra hit a two-run homer in the fifth. The way Phil’s been pitching lately though, a stinker is expected. At least he got the win. His final line looked like this: 5 Ip, 4 H, 4 R, 3 BBs, 2 HPB, 9 Ks, 102 pitches and his team leading sixteenth win of the season (16-12). The bullpen mostly held onto the lead, except for Corey Wade, who has gone back to being terrible after giving us exactly one outing of hope. It was very nice to see David Robertson pitch the ninth and strike out the side for his second save of the season. The way David’s been pitching, we all needed that. Remember when Ichiro had seven hits in that double header on Wednesday? Yeah, he wasn’t done. His first at bat of game three came in the bottom of the third inning, and Ichiro kept his vintage day going, hammering a line drive home run to right to put the Yankees on the board. In the next inning, after Martin walked, Granderson reached on an error and McGehee walked, Ichiro doubled in two runs to give the Yankees a 3-2 lead. It was Ichiro’s ninth straight hit. Overall, he went 9-12 in this series. 9-12! Anyway, the Yankees kept the inning gunning after that, as Nix walked to reload the bases and Jeter singled in McGehee to expand the lead to 4-2. This brought up Nick Swisher, who has been trying to bust out of a slump for the past week or so. Swisher got a fatty fastball up in the zone from reliever Brad Lincoln and hit his third Grand Slam of the season (the Yankees’ tenth, a franchise record), and the Yankees led 8-2. The Yankees ended up tacking on a couple of runs in the very next inning, when Nix doubled in Granderson and Jeter singled him in. The ten runs were a welcome site because of Hughes’ struggles. It’s a shame that, with ten runs scored, the Yankees weren’t able to coast, but a win is a win. I have just a couple of thoughts from the series I’d like to share with you. I was amazed that, as good as Ichiro was in this series (9-12, 3 2B, 1 HR, 4 RBI, 4 SB), it was just a hint of the Ichiro that the Mariners must have had for almost ten years (before he got old). How exciting must it have been to watch that guy every day in his absolute prime? Incredible. My other thought is on the irresponsible twitter reporting that led to the rumors that Robinson Canó had failed a PED test and was set to be suspended for 50 games yesterday. I’m not trying to get on a high horse, but can people stop trying to make their careers by rolling with unverified information? The guy who reported the Canó rumor, Dan Tordjman of Charlotte, NC, went from being 100% sure to claiming it was just a rumor to basically disappearing from Twitter for the afternoon. I don’t blame the Twitter folks who passed the rumor along, as I mostly read tweets from fans or anti-fans commenting on the rumors. Most responsible reporters either refrained from commenting or came out to say that the rumors were false. The annoying part is the few hours I spent semi-devastated because my favorite player was possibly going to be suspended. Also, now that thought is in everyone’s head. Where did this rumor come from? Could Robinson be doing something illegal? He’ll have to answer that question over and over again, possibly through the end of the season. That doubt has definitely creeped in. The Yankees are supposed to be untouchable when it comes to PEDs (well… nowadays)… that was a scary afternoon to say the least.